A breakthrough design that is more affordable and lighter in weight than most other lighted nocks. The NockTurnal has a string activated linear switch that is protected deep within the nock and will not turn on or off inadvertently. Battery last over 20 hours. 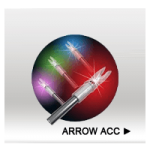 Made of clear plastic for maximum light transmission --- can be seen for hundreds of yards. Speed saving ultra-light design... only 20 grains TOTAL weight... most other lighted nocks weigh 25% - 50% more! 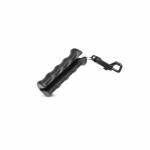 3 per pack Super Strong Clea..
A must have for 3-D shooting or any target shooting. Helps lube your arrow for easy target removal. 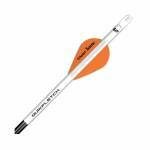 Target Arrow Release Fluid Convenient Felt Tip Applicator Easy Arrow Removal From Targets Removes Dirt & Debris Extends Arrow Shaft Life Non-Toxic and Non- Flammable 100% Odorless and Waterproof Weatherlock Technology .. 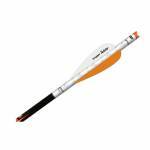 The specially designed bar grip is large enough to fit all arrow sizes yet small enough to pull arrows from tight arrow groups. The molded finger grips and the y-groove compression channel give extra pulling power. Comes in a cool Black/Green design. 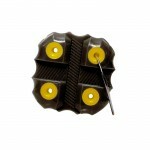 ..
holds six sharpened insert or solid type fully assembled broadheads. 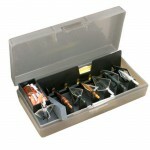 You can also organize all your items such as sharpening stores files (up to 7") fletching target points inserts nocks spare blades etc. in the two storage compartments provided AND it comes with a broadhead wrench! .. 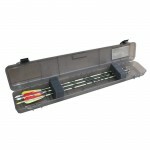 Designed to fit into a soft bow case pocket the Compact Arrow Case holds 18 to 24 full length arrows with broadheads (which are held in place by foam). The case is held shut with MTM's snap-lock latch system. Hinges are made of stainless steel. Two padlock tabs are provided for security. Made with luggage grade polypropylene for longevity. 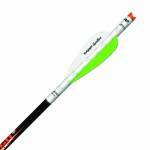 Dimensions: 36.25" x 7.5" x 3" For Arrows up to 35.75" total length ..
NAP QuikFletch QuikSpin Crossbow Vanes 3". QuikFletch vane system is designed specifically for today's fastest crossbows, making it faster and easier than ever to replace damaged vanes on crossbow bolts. With a shorter profile 3" vane, the QuikFletch rides freely within the rail groove, providing a clean release that offers true downrange flight and accuracy out of today's fastest crossbows. Pack of 6. 36 Grains Vane Height: 15/32" (0.47") ..
A breakthrough design that is more affordable and lighter in weight than most other lighted nocks. The NockTurnal has a string activated linear switch that is protected deep within the nock and will not turn on or off inadvertently. Battery last over 20 hours. 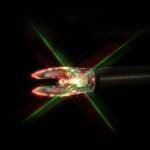 Made of clear plastic for maximum light transmission --- can be seen for hundreds of yards. Speed saving ultra-light design... only 20 grains TOTAL weight... most other lighted nocks weigh 25% - 50% more! 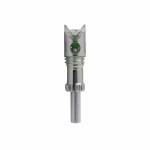 3 per pack * Nockturnal-S - "st..
Nockturnal Lighted Nocks - Green Predator Size 2. No prep work needed - insert and ready to shoot. 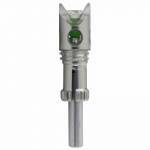 Piston driven contact switch ensures LED illumination every time. Waterproof and shock resistant. Battery last over 20 hours. Size 2. Green. 3 per pack. ..
Nocks can go straight form the package to the shaft in fully operational condition. No prep work needed. Just insert it, and you are ready to shoot. Over 20 hour battery life. Off switch to turn off light after arrow recovery. 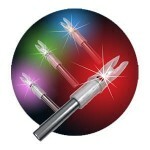 3-Pack Green LED String activated switch upon firing User accessible switch to turn off light Fits - CE Crossbolt, Carbon Express Maxima Hunter, Carbon Express Surge 20", CE Red Hot, CE Parker, Easton FMJ, Easton Power Bolt, Easton 10Pt Pro Elite, Beman Ca..
Nocks can go straight form the package to the shaft in fully operational condition. No prep work needed. Just insert it, and you are ready to shoot. Over 20 hour battery life. Off switch to turn off light after arrow recovery. 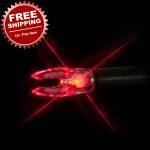 3-Pack Red LED String activated switch upon firing User accessible switch to turn off light Fits - CE Crossbolt, Carbon Express Maxima Hunter, Carbon Express Surge 20", CE Red Hot, CE Parker, Easton FMJ, Easton Power Bolt, Easton 10Pt Pro Elite, Beman Carb..
A must have for 3-d shooting, Flexible lightweight material provides a superior grip to pull your arrows from those 'hard to pull' targets.Designed to grip/remove any size arrow shaft with ease. Belt/quiver clip included. Assorted colors. We can not guarantee specific colors when ordering. .. The specially designed bar grip is large enough to fit all arrow sizes yet small enough to pull arrows from tight arrow groups. The molded finger grips and the y-groove compression channel give extra pulling power. Comes in a cool Black/Pink design. .. The specially designed bar grip is large enough to fit all arrow sizes yet small enough to pull arrows from tight arrow groups. The molded finger grips and compression channel give extra pulling power. 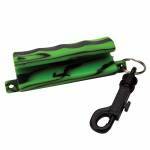 Easy–on arrow opening Contoured design for better grip Bell housing increases pulling force Solid rubber puller construction Quick release hanger clip included Reinforced hinge for long life Simple one–hand operation Made for all arrow types .. If you can boil water, you can professionally crest and fletch an arrow in less than 10 seconds. QuikFletch is the easiest way to fletch your arrows either in the field or at home and they are guaranteed not to slip!!! They shrink to fit any size carbon or aluminum arrow shaft. 6-per Pack, Vanes are White / Orange / Orange. .. The QUIKFLETCH® vane system has become synonymous with “ease of use”. The 3-inch Crossbow QuikFletch—designed specifically for today’s fastest crossbows—makes it faster and easier than ever to replace damaged vanes on crossbow bolts. With a shorter profile 3” vane, the crossbow QuikFletch rides freely within the rail groove—providing a clean release that offers true downrange flight and accuracy out of today’s fastest crossbows. The time-saving, hassle-free benefits of the QuikFletch vane syste.. Size - S Instant-on string-activated lighted nock High-performance Aerofoil vane Design increases spin to ignore crosswinds Easy to locate after firing 3-Pack Fits: Carbon Express, Beman ICS, Easton, PSE, Victory, CT, Carbon Impact ..